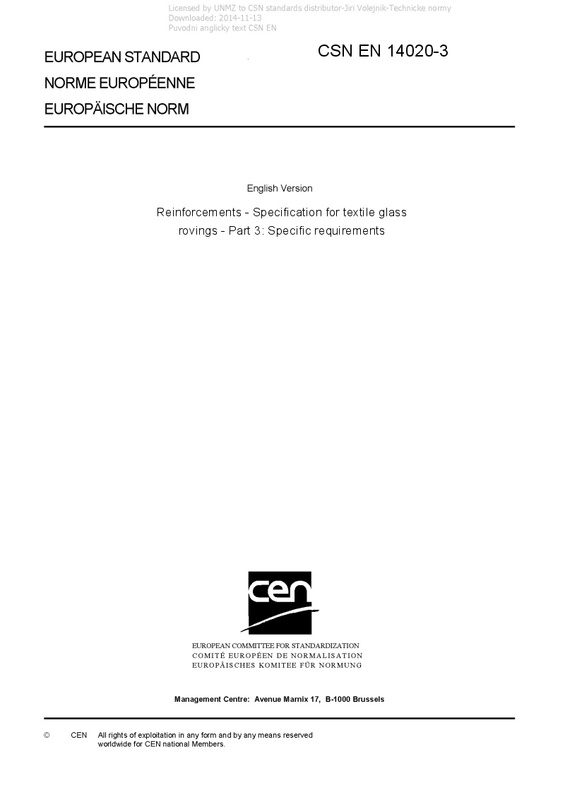 EN 14020-3 Reinforcements - Specification for textile glass rovings - Part 3: Specific requirements - This part of this European Standard gives a technical specification for rovings that are made from continuous filament textile glass. It defines those parameters which shall be specified plus other parameters which may be specified if required for a particular application or processing method. The specification does not define absolute or nominal values for any parameter. The value of a specified parameter is to be defined by the manufacturer but this specification defines the method of test to be used to determine the value of each specified parameter and the tolerance about which the parameter shall be controlled by the manufacturer. The parameters which shall always be defined in any roving specification are defined in clause 4.1 and 4.2. The other parameters which are included in a specification shall either be nominated by the manufacturer or agreed between manufacturer and customer. These parameters are defined in clause 4.3.